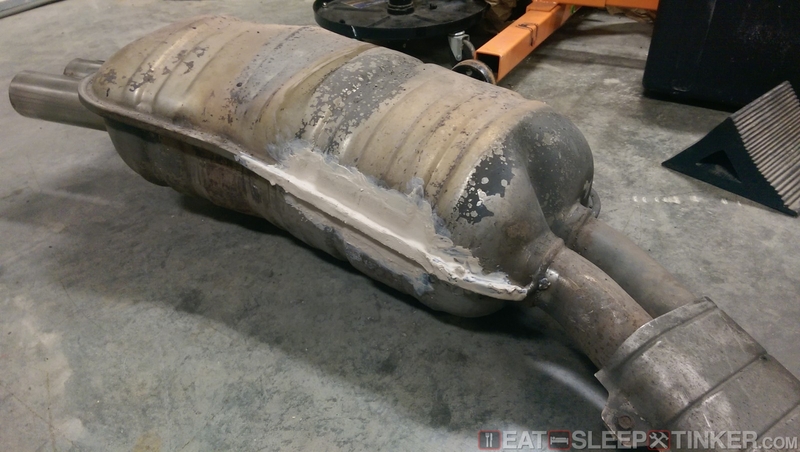 Eat, Sleep, Tinker.E36 M3 Muffler Repair - Eat, Sleep, Tinker. 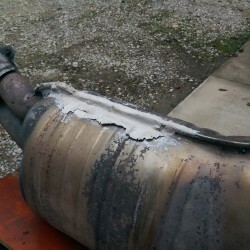 I found that my stock muffler had split along its seam from rust during one of my many visits to the underside of the ’98 M3. As previously mentioned, the car began its life in New York state, which surely involved some salted road driving. I had already tackled much of the rust repair, mostly nut and bolt rust removal on the rear subframe and a few replacement parts on the front subframe & steering. 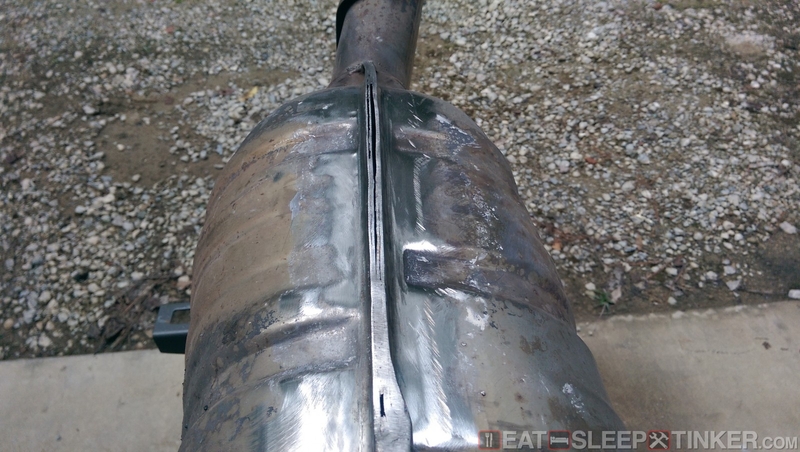 The stock muffler is comprised of two stamped pieces of stainless (unsure of the grade, but enough to rust) that are pressed together, with a lip formed around the perimeter. 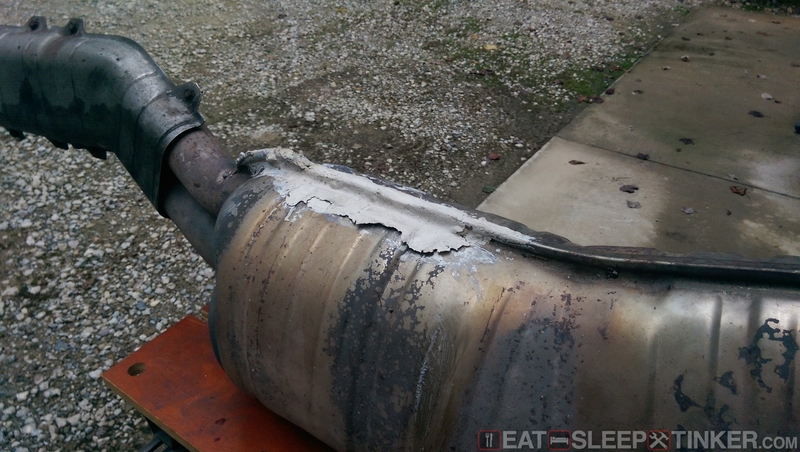 My muffler had rusted out along a 6-8″ section of the inboard seam. Otherwise it was still very serviceable, no signs that it had lost packing or was leaking. But to make it right and ensure it lasts, it needed to be repaired. 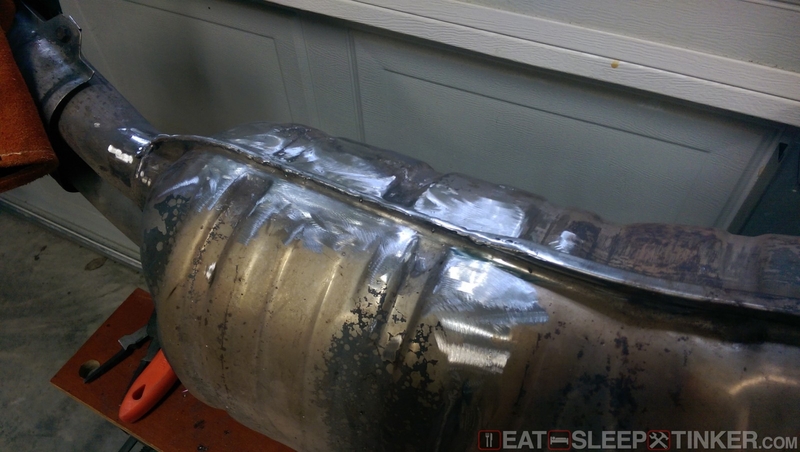 The proper repair would be to grind away the rust scale and weld the seam back. I pulled the exhaust, cleaned and grinded and then cleaned some more. I clamped the two sections together with some Vise-Grips then attempted to weld it with my MIG welder. That’s when things started going wrong. For some reason I was getting terrible welds. Nothing was sticking, no puddle forming, things I had never seen before. Changes to voltage, wire speed, gas flow made no difference. Then I discovered that I had put a roll of aluminum wire on the spindle. Do’oh! I had just grabbed the “stainless” colored spool, not noticing that I had aluminum wire. Well that certainly would create some issues! I put the proper stainless wire on and tried again. This time I was getting a proper arc, but poor pooling and I was getting terrible contamination. After completing each run, the still molten puddle would bubble up, looking like pumice stone. What the hell?! Again, I tried messing with voltages and gas settings to no avail. And for what it’s worth, I was using a not ideal 75/25 Argon/CO2 mix. Yes that is what should be used on mild steel, not stainless, but it’ll work in a pinch for non critical SS welds. 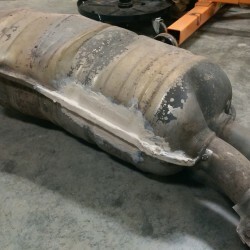 I’ve used it before several times on exhausts without issue. Nothing I tried would keep the weld from bubbling and showing lots of contamination. Time was running short before my departure for a Road Atlanta track day, so I decided to go the cheap route and temporarily cover the damaged area with one of those “muffler patch kits” you can find at the parts store. This patch kit was only meant as a temporary fix until I could either properly weld the muffler or find a suitable replacement. 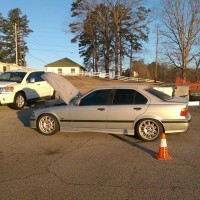 Good thing this was the plan, because it didn’t last the single track weekend. 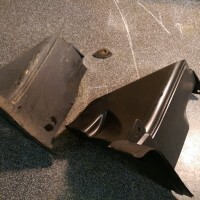 I think some high-temp JB Weld probably would have done better, as this one part patch materiel was almost like a tube of clay and hardened in a similar fashion. 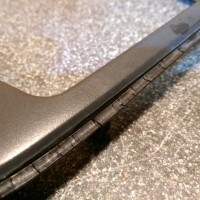 It came with a piece of metal mesh to help strengthen the repair, but that didn’t keep it from flaking off the metal substrate. After returning from the track weekend, I pulled the exhaust again to see about making a more permanent repair. 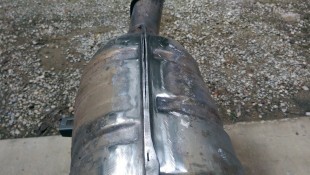 The exhaust patch had cracked and separated from the metal. A metal scraper easily removed the remainder of the dried paste. 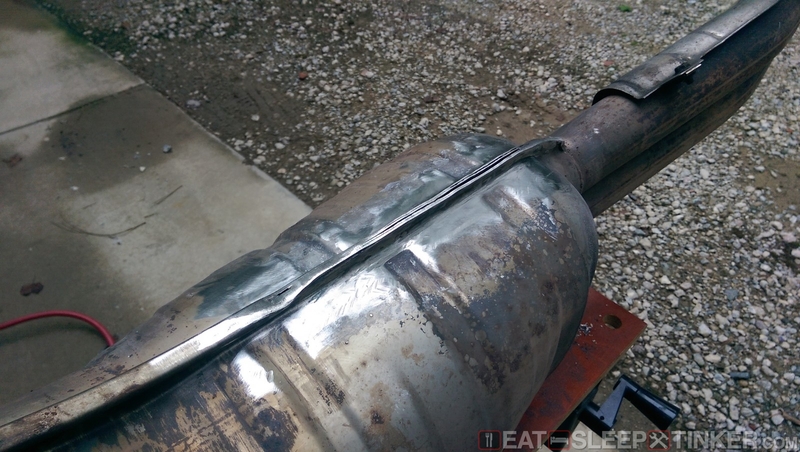 Before I gave up on this original exhaust, I decided to try welding it one more time. This time I completely ground down the rusted and split seam until I knew I had clean original metal. I also scrubbed it with acetone and a wire brush. My thought was that the years of driving on salted roads might have left residue down into the space between the layers of metal. I fired up the Hobart again, only to end with the same porous results. Something else was wrong. To help rule out the working piece or the welder itself, I attempted a practice weld on a piece of scrap mild steel. 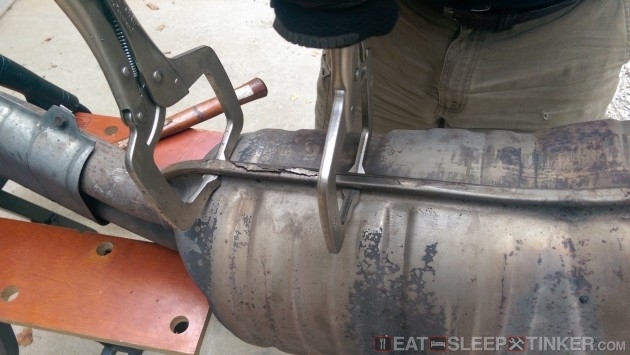 I got the same result, so it was something with the welder. Then had a thought; I hadn’t had issues with the welder until I had run the aluminum wire through it. Perhaps it had contaminated the gun liner. 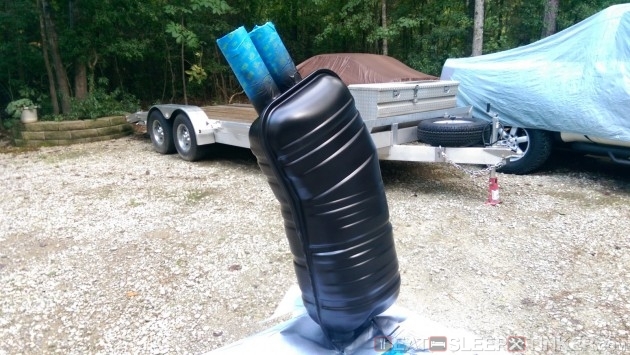 A quick run to Tractor Supply Store netted a new liner. Not only did I install a new line, but I also cleaned the rollers with acetone and replaced the tip as well. I cut off all the wire that had previously been down the liner, starting with fresh stainless wire. I ground down the muffler seam some more, cleaning it very diligently with a stainless brush and more acetone. Then I clamped the split seam back together tight with some Vise-Grips, hooked up the ground lead, and tried to weld a tack. Success! My problem all along was the contamination from the aluminum wire, ruining my gun hose liner. 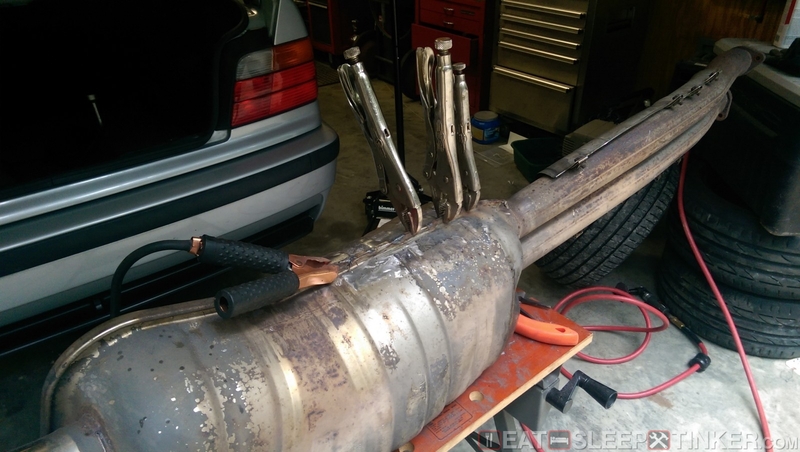 I added tacks between the clamps to hold the seam, then removed the clamps to finish the welds and seal the muffler. With the damaged area repaired with fresh weld, I then started to clean up the rest of the muffler. These mufflers come painted satin black from the factory, which helps disguise their girth when hanging down below the rear bumper cover. 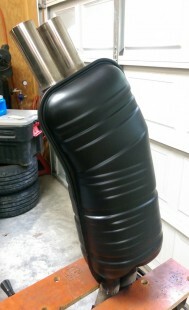 Over time this black paint wears away, leaving a dull and oxidized bare metal. 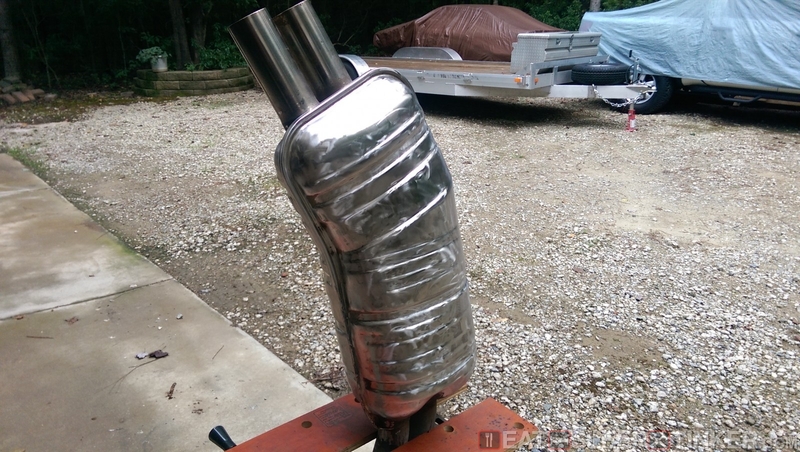 I put some 3M Scotchbrite pads on the pneumatic angle grinder and went to work removing the remaining original paint and years of road grime baked on the muffler’s case. 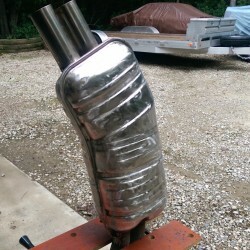 This took a while but left the muffler looking nice and shiny. I gave it a good wipe down with some acetone, taped off the polished tips, then began painting. I had a can of high temp satin black on hand, which appears to have worked near perfectly at returning the muffler to a like new finish. Time will tell how well the paint holds up, but at least my weld repair should keep the muffler together for another 16 years.